experienced a first: his likeness on a Brazilian stamp. “I’ve been to Brazil about 15 times,” he said. “There are three different Masonic groups, and although they relate to each other, they don’t acknowledge each other or recognize each other, and I’ve been working for years to get that rectified,” he said. On the last day of a Masonic Conference in Brazil, on June 24, leaders presented Brother Tom with the stamp, which states in Portuguese that it is given in recognition of his service in promoting universal Freemasonry. much more. All are gifts of appreciation from those he has helped, both home and abroad. 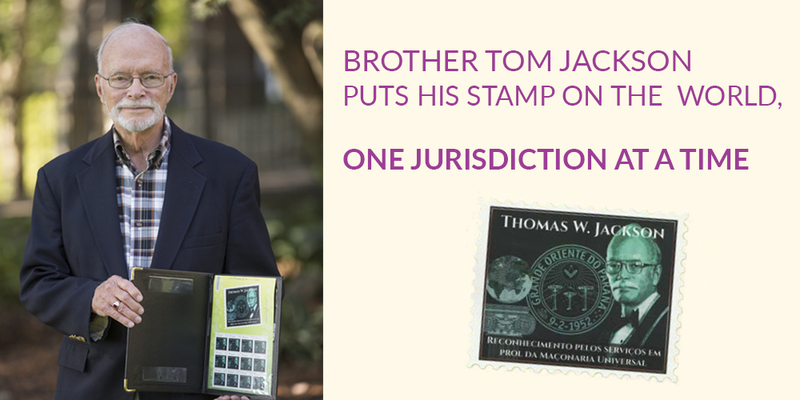 In 2015, Brother Tom retired from the job that sent him on many of these ventures. The first time he was elected as the first Executive Secretary for the World Conference, he initially did not want the position. After he was unanimously elected by Grand Masters and Grand Secretaries from around the world a second time, he agreed to accept. He never expected to serve for 16 years. Brother Tom now serves as Honorary President of the World Conference. He continues to receive calls to travel and advise on various situations. The key to the successful mediation, he says, is trying to listen to reason. “I’m generally out of the country half the year. I’ve been to 15 countries so far this year, and quite a few more to go,” he said. “I’ve really been fortunate. I have traveled to much of the world.” He has met the presidents of Portugal, Chile, Romania, Mozambique, Mali, Gabon, Chad and Congo, as well as former U.S. President George H. W. Bush. He’s also been hosted by several prime ministers. Brother Tom, who was born in McKeesport, moved to Shippensburg when he was 12 years old. “I grew up in a relatively poor environment,” he said. “Neither of my parents went past eighth grade.” Brother Tom graduated from Shippensburg High School in 1952, and from what is now known as Shippensburg University, where he studied biology and chemistry, in 1958. He then earned a master’s degree in zoology from Penn State University. Carter Beard Masonic Scouter Award for his service to Boy Scouts of America. After teaching for 17 years and serving as a sales manager for a construction company, in December 1979, he was elected Grand Secretary of the Grand Lodge of Pennsylvania. Masonic journals, as well as newspapers and publications throughout the world. Some of his papers have been translated into more than a dozen languages and printed in over two dozen countries. In addition to having served as a master of his own Lodge, he was a representative in Grand Lodge, the Warrant Master of the Pennsylvania Lodge of Research, Grand Secretary for Foreign Relations and Chairman of the Academy of Masonic Knowledge and the Committee on Foreign Recognition. Not only does Brother Tom hold Lodge memberships in Wyoming, England, Italy, Peru, Morocco and Cyprus, but he has been granted honorary memberships in 107 Grand Lodges. He holds grand rank in 30 of these Grand Lodges, 14 of which as honorary Grand Master. Brother Tom’s wise counsel continues to be sought, and he is by no means slowing down his mission to spread the light of Freemasonry. In so many ways, he has placed his stamp on the world.